Personal Customer Service is our number one priority! At Edmunds Ace Hardware, we work with our customers to help you find the right solution to your project. 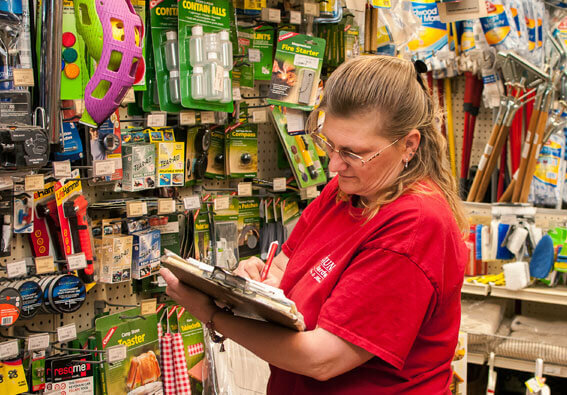 Whether it be painting, repairing a faucet , seeding a lawn or purchasing a new grill, the staff at Edmunds Ace Hardware has the knowledge. We will also research and place special orders to get you those hard to find items! No need to drive all the way to the Big Box stores – Edmunds Ace Hardware has everything you need, here in town! Edmunds Ace Hardware is centrally located and easy to get to with two convenient locations. On route 202, Main Street Antrim NH and the intersections of 202 and 114 in Henniker NH. As a family owned and operated business since 1942. There are currently three generations participating in the daily operations of the business. Edmunds carries a full line of tools, parts, and materials for all types of residential and commercial plumbing jobs. Edmunds stocks copper, cast iron, galvanized, and PVC pipe. From sump pumps and pipe fittings, to solder and pipe wrenches, Edmunds is the source for all your plumbing needs. We carry a wide array of light bulbs and electrical parts for commercial, residential, and industrial applications. Everything you need for lighting, wiring, heating and cooling. We sell bulk wire, cable and connectors, high voltage components, and hard to find parts for switch boxes and breaker panels. Interior and Exterior Stains from Minwax, Color Matching Service, and of course Benjamin Moore Paint! Whatever your project may be, Edmunds Ace Hardware has the right tool for the job. With brands like Stanley, Black & Decker, Dewalt, Makita, Edmunds’ offers a full range of hand tool and power tools for all your building and construction needs. You’ll find competitive pricing on these items without ever having to leave town. Housewares and kitchen gadgets, small appliances and cleaning products, tarps, canning good, sewing supplies, stationery items, toys and sporting equipment, vacuum repair service, pet stuff, bird food and bird houses, seeds, hoses and sprinklers, flower pots, pesticide and insecticide, weed killers, insect repellents, rakes and shovels. We provide a variety of services: Window Repair, Glass Cutting, Key Cutting, Shade Cutting, Screen Repair, Sharpening Service, Electric Tool Repair, Lamp Repair.